You’ll have good fortune if you were born on these days—but even if you weren’t, they’re still the luckiest days of the month for you. In Chinese astrology, the year you were born dictates your sign—not the month. You can figure out your Chinese zodiac sign here, along with what 2018 has in store for you. For each sign, certain days of the month are particularly significant—they could be the best day for, say, meeting someone special or investing. For the rat, the 4th and 13th days of every month are the most auspicious. Tigers are confident, competitive, and brave. Their qualities come together to create and greater chances for success and wealth on these days of the month. Check out these lucky New Year’s traditions from around the world. With three lucky days each month, the Rabbit gets extra chances at good fortune. Thanks to their ability to connect with other people, a Rabbit’s relationships—family, friend, and romantic—will grow on these days. Ostentatious, inspiring, and a flair for the dramatic—”Dragons are very dazzling and creative,” Smith says. In Chinese culture and legends, dragons are a highly revered creature. Although they’re already held in high regard, Dragons can expect their lucky days to deliver the chance to prosper in their professional life. The antisocial Snake can use their auspicious days to develop personal relationships—a boon, considering Snakes like to “live by their own rules,” explains Smith. These two days offer an opportunity to grow and step into the spotlight to experience the kind of positivity and optimism they often lack. According to Smith, horses are creatures that are “part of the human landscape,” having played a huge part in humanity’s development and prosperity. 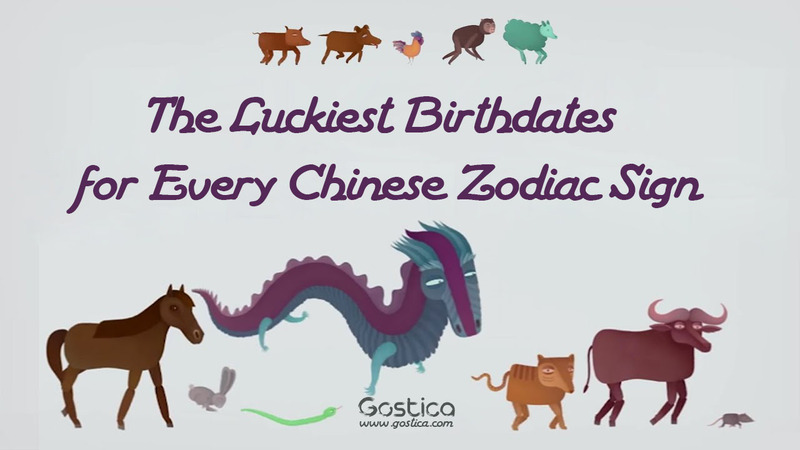 Recommended: Love Compatibility: What Chinese Zodiac Sign Is Your Soul Match? Smith also says they are connected to the element of fire, so they can be very lively and enduring. That is why their hard work and power will be recognized on these particular days. Monkeys can be zany, eccentric, and fun. Smith says. “The Monkey stirs things up and makes things happen.” On their luckiest days, they’ll make gains in their careers and social lives—plus they’ll get to be the center of attention. Much like Dragons, Roosters are flamboyant and independent. They are trendsetters and trailblazers who will see their success in business and their notoriety soar on their lucky days. Check out the seven things lucky people do that you don’t. “Dogs are warm, they connect with people,” Smith says. Dogs want to be with others to help them connect with their humanity, she explains. On these days, Dogs will experience even more good fortune in their social life. Smart and brave, Pigs will receive extra recognition on these days for their tendency to be respectable and professional. They’ll have a better chance of promotion or some other advancement in their careers. Read up on the 10 habits that could be costing you a promotion.